As I mentioned last week, I’ve decided that my February goal (a.k.a. goal #3) is to do Project Life in 2013. I’ve already started on Project Life because I wanted it to span the entire year. So I spent the better part of January thinking about what didn’t work for me last year and brainstorming solutions. Over the course of two blog posts, I’ll be sharing the obstacles that tripped me up last year, as well as the solutions I’m going to give a try this year. Obstacle: This can get complicated pretty fast! As a beginner, I’m going to stick to using my Project Life core kits. I ordered the Seafoam kit this year and I have the Turquoise core kit from last year. I’m giving myself permission to mix these kits (this is big for me!) and let my pages evolve over the course of the year. I’m also giving myself permission to be a beginner in terms of photography. One of the side benefits I’m hoping to gain from this project is improving my photography skills. But for now, I’m okay with being a beginner. As silly as this may sound, I have repeated “be a beginner” to myself many times in these first five weeks of Project Life. It is incredibly freeing. You’ve gotta’ walk before you can run. Obstacle #2: I don’t have time for this project. Solution #2: Schedule time for Project Life. Here’s what I know for sure: The stuff that gets done in life is the stuff we carve out time for. Last year, I didn’t stake a claim to specific blocks of time to do all the steps involved in Project Life, from downloading, editing, printing and picking up photos each week, to assembling the finished pages. This project isn’t something I could simply fit into the cracks in my schedule. It needs a spot—just like laundry, cleaning the house and grocery shopping. And that’s a good thing! Project Life is way more fun than laundry, cleaning the house, grocery shopping and other mundane but necessary chores of life. It’s really energizing to have this new appointment with myself on my calendar. It’s something I look forward to. My project Life weeks run Monday through Sunday. (I started on Monday, December 31.) My plan is to download photos weekly (on Sundays) and then edit photos every other Sunday (on weekends when we don’t have Sunday dinner with my in-laws.) So far this hasn’t gone per plan for various reasons (i.e. the “surprise” Super Bowl game last Sunday.) But here’s the thing: by carving out time to do this, even if it didn’t happen exactly when I planned, I still made it a priority and found time to do it. I edited and printed week 4 and 5 photos last night…a day late, but it still happened. Obstacle #3: I don’t want Project Life to take away from my family time. Solution #3: Fit Project Life into our lives. One of the things that tripped me up last year was that I didn’t want Project Life to become something that caused me to spend less time with my family. Even though many days I work out of my home, I work full time and when I’m at work, I’m not with my kids. They’re at school or upstairs doing their thing while I’m down stairs doing mine. Obstacle #4: I didn’t have a system. Solution #4: Create some simple organizing systems that make Project Life easy to do. And that’s what I did—I created some simple systems to make Project Life easy to fit into my life. I’ll share the details in the Part 2 post coming up soon. If you do Project Life, what obstacles have you encountered? What solutions have you put in place to navigate around them? Thanks for sharing! Aby, I’m so glad to hear you’re giving this another try! Last year was my first year doing PL and I LOVED it. I’m not a beginner with scrapbooking so I jumped in with both feet and went big. However, I learned quickly that some weeks are “more” than others with regard to the finished product. And that’s OKAY. I also learned that as much as I love photography and I love to use my husband’s camera, at least half of my photos in my PL albums (yes, I’m doing it again this year!) are from my phone. that means the quality isn’t as great, but this project is about LIFE, not the quality of my photos. I also love that even if you get a few weeks behind, it’s “easy” to “catch up.” I started behind last year (I had to wait until mid to late February for the Style A page protectors to be in stock again) and yet I finished the whole 2012 album within a week of the year being over! And that includes being away from my album for 3 weeks during our summer vacation… and moving across the country, and moving from a rental into our own home 6 months later…. yeah. all that stuff. i am hooked! Thanks, Tamara! I love your enthusiasm for Project Life. OMG thank you sooooo much for this post! I haven’t even attempted to start PL (even though I’ve had my kit for a year now) for these exact reasons! I even have an old computer desk that I’ve been wanting to repurpose! My birthday is in a few weeks, I think it would be a good starting date and you’ve motivated me to give it a go!! I agree, Cara, that would be a great time to start!! Happy (early) birthday. My obstacle is setting the time aside to do project life. I love it for so many reasons, but setting aside a regular time to work on it is a little hard right now. I had planned to do Sunday naptimes, but that hasn’t worked since the girls aren’t taking naps at the same time. So I’m stealing time throughout the week and I’m working on documenting stuff when it happens so it’s easier to go back and put together when I have time. Great idea to document as you go! I bet it is hard to set aside time for it with two little ones…my kids are bigger now, so that helps a lot. But boy do I wish there had been PL when my kids were little! This series is perfect timing since I just ordered my project life kit. I’m excited to get started. Yay, Lisa! Which kit did you order? I have three completed Project Life albums and they are a favourite for our family. They are hard work but so worth it when finished. A real glimpse into our lives. That said, I wasn’t really that enthusiastic about embarking on number four. I am a digital scrapbooker now and PL was my only paper project. I think I was just burned out with the physical aspects of printing, trimming, handwriting. I had toyed with the idea of doing the project digitally this year using the templates and just printing the pages 12×12, so it would look like my previous versions. For some reason I wasn’t really excited about that either. And I knew I would miss the ephemera I kept in the pockets but did not want to have to scan stuff in. But I bought the Seafoam version and the childhood versions digitally and made a test week. Loved it! I had always spent a lot of time in photoshop for the paper version anyway (text onto photos, resizing) and doing a digital version is just the next logical step. It’s so easy and fun too. I am loving it. I usually work on a spread here and there during the week and try to finish it up on Sunday, and get the next week’s title card ready to go for Monday. I also added a basball card protector sheet (8.5 x11) into the month for movie tickets etc. So while I know I will love this finished product come December, I am also loving the process again. Thanks for your comments Shannan! I loved your comment about loving the process again – that is so important – enjoying the journey, as I like to say. Agree with all of these! I have scheduled Project Life as a Sunday activity since I started in 2010. I’m hoping it’s even easier because I’m using the digital version this year and I can actually work on it even if we are gone on a Sunday. I have always used PL in it’s simplest form and hardly ever make any extra additions. One thing I always did with the paper version was to put in title cards and journal cards in all the page spreads. I pretty much stick to Design A and this took some of the work out of every week. I’m tempted to start doing at least the background papers and title cards for digital pages ahead as well. Thanks, Sonya. Good point about sticking to just one sheet protector design style – I can see how that would simplify things. I can’t wait for the second post! The first post really motivated me, since I’ve struggled with the same issues. Love your ideas and logic Aby. You’re such an inspiration. Thanks so much Stephanie. You made my night. It does sound like you discovered a great time-saver SuzieQ. I have last year’s Clementine kit and tons of page protectors. Last year I did about 5 weeks of PL and then got derailed when my brother passed away unexpectedly in early February. I think if I had been organized and had a planned time set aside, like you this year, I would have successfully gotten back on track. But my biggest obstacles seemed to be: (1) my craft room is too far removed from family and the TV, and I don’t like being isolated, and (2) I was getting really crazed trying to figure out how to fit my photos into the slots of the page protectors. I always seemed to take one or two photos that needed to be oriented in landscape, when the rest were in portrait, and then I’d be unhappy trying to carve them up to fit into the page protectors, etc. Well, basically, I think maybe I was doing as you had done and making everything too complicated. I’ve been wondering if I should try this again and just simplify my expectations! Oh I hope you give it another try with simplified expectations. So far I’m just using the Design A page protectors. http://www.amazon.com/Photo-Pocket-Pages-Design-A/dp/B0049MFWZI/ When I have portrait photos, I size them in elements to fit in the 3 x 4 pocket. It has been working well for me so far. I decided to do it monthly rather than weekly. I will highlight a few key photos to introduce each month. Then my layouts for the month will follow. Monthly is a great approach. I’m thinking about going back and doing monthly pages for 2012. Thanks for this post! I actually won a complete line of Project Life products last year, and never started because I’m such a perfectionist… If I can’t do it perfect, why start at all? I want to get over that and just give it a try, and you offer great ways to get over all my excuses and dive in. Oh since you have a kit already, you should give it a try! From doing a few week in the life projects I have realized that I’m much more critical of my pages when they’re fresh. When I look back on them, I just see the memories, and am just so happy I did them. I’m trying to keep that in mind with Project Life this year…so perfectionism doesn’t trip me up. I never embraced project life because it seemed constant and heavy. I did a photo a day in 2009 and it absolutely changed the way I view my camera, in both good and bad ways. When I did a photo a day, I weekly tried to pull each days photo and then on the last day of a month I did one 12×12 layout that was completely photos. I squeezed them in by trimming them down and angle them. About half way through 2010 I actually enjoy that photo a day album. So this year, I decided I was ready to do a photo a day again, but as I was contemplating the set up I got a couple of brilliant ideas. I’ve desperately wanted an excuse to buy a smash book and I wanted to couple the photos with a grateful journal I’ve been doing. So, I bought the smash book, (it gave me permission to not be all scrapbook police about it), I titled it Color Me Grateful and threw a rainbow of my kids marks, some washi tape and a date stamp deal with a black ink pad into a project box and got started. I upload my camera every Sunday, email the weeks photos to my husband at work, he brings home 3×5 prints on regular printer paper and I smash them into the book with journaling. I usually create the page on Tuesday at work (I’m a nanny). I will admit several other scrapbook supplies have made it into the project box now that I’m on a roll and know the things I tend to reach for. I really like my book. The down side is there are only 40 spreads available in the book and 52 weeks in a year, so I’m gonna have to do some single pages. I did it this week, lets home next week lends itself to using the other side. For me, it’s project life without spending the $30 on a kit and without working so hard at it. Love the idea of a Color Me Grateful smash book! Aby I love your process … I did PL last year and managed to get my photos printed and a few months worth actually slotted into my album but have yet to pull it together … then I saw your desk all organised and ready to go … now I know why I stalled! everything is still in a box!!! eek. Looking forward to the next post…and I have total desk envy!!! Do you have a space where you can set up shop that’s in a convenient location? working on it…. last year it moved from my dining table (central location) up to my craft space in the loft, then back down and then back up again…. I was torn between having it to hand to work on in odd moments (but squished into a small space), or having it all laid out and working on it once a week. That is a tough choice. I wonder if you could do a bit of both. 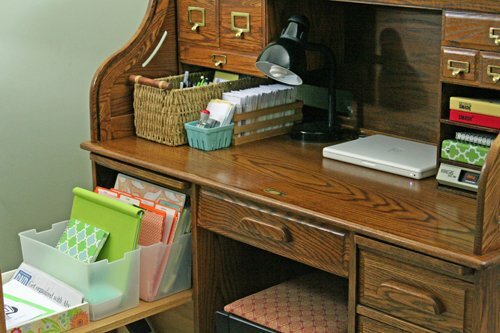 I keep minimal supplies for Project Life on the main floor…everything else is downstairs in my office. I wonder if something like that would work for you…? Hi Aby. I’m new to PL this year. I loved your perspective about being a beginner. I also have been collecting ideas on the internet and had to remind myself several times that #1-scrapbooking is not my job-it’s what I do to relax and have fun & #2-there is no wrong way to do this. I have kept up so far 5 weeks in & what’s helping me is printing at home on an older Selphy. I also work one week back, and carve out time on Sunday afternoon to get the majority of it done-it’s something I look forward to now! I love the photos I have that I’ve taken just because of PL & it’s forcing me to get over my perfectionism & get the memories recorded in a way that regular scrapbooking wasn’t. Great reminders! Thanks for sharing them. 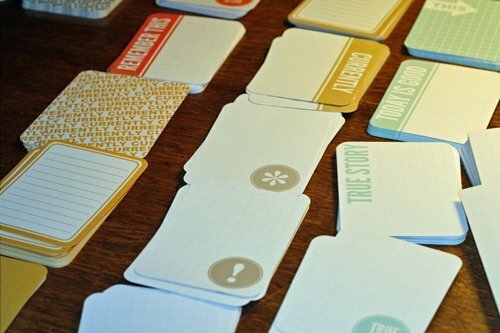 Project Life is helping me get past scrapbooking perfectionism, too. Well, I must have been living in a hole the last few years because I don’t think I’ve heard of this until seeing your post today. I’ve never scrapbooked due to my perfectionism and the unacceptable reality that I would never be caught up! But… thanks to you and all of your commenters, I think I’ve gotten the gist of a Project Life and can totally see, not only the value of it for the whole family looking back, but even the necessity of doing it without being perfect. I am busy enjoying living my life with four littles, but I don’t want to forget some of the daily details that make it so enjoyable. Thanks for the inspiration! This is the first I have ever heard of PL. It seems like it would be quicker, but I enjoy the time I do traditional scrapooking. It is SO MUCH MORE CREATIVE!! I guess you have to decide which you want fast and concise or creative, more embellishments and more fun.